These blocks were supposed to be finished a couple of days ago, but things got kind of insane! I started training at a tutoring center (which I am LOVING), and I had in-service as school (can't wait to meet the kids on Tuesday, and see the ones from last year!). 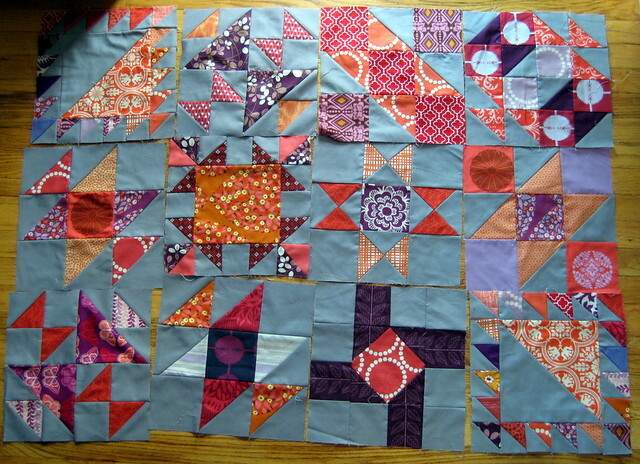 To finish them, I went on a bit of a cutting and chain-piecing spree. You can see more blocks in my Flickr photostream, if you are interested! They are so pretty together! What is the background color/fabric you're using? It looks like a greyish blue. These look great! You've been busy. You sound pretty excited about the coming academic year. Good luck with it. I love those blocks they are fantastic. 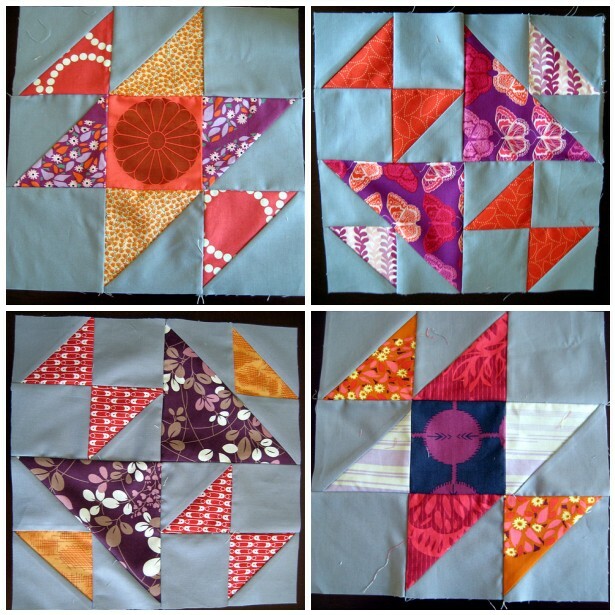 They look fantastic all together Jess - really great blocks! looking great. I am still stuck on January!! I think now I will just make a few more and make them into pillow covers - I am never going to catch up on them all! I have to agree... Your fabric selections are awesome and your piecing is amazing! Great job on those blocks! Can't wait to see the finished top! I love the gray background on these blocks. It makes the colors really pop! Your blocks look fantastic. Practice really does help :) Nice job.